After you add an identity, you can use it to send email (using a different address) with your primary email account. For example, say your primary email account is me@example.com, and you want to send email on behalf of the marketing team. Add an identity for the marketing team (mktg@example.com) and send email using that identity from your primary account. 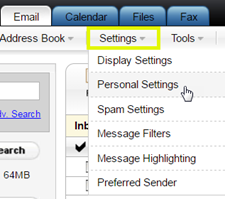 In Classic View, on the Settings menu, click Personal Settings. Click the Identities tab, and then click Add Identity. Name Enter a name to display to your email recipients. Email Enter an email address to display to your email recipients. Reply To Enter an email address you want your email recipients to send replies to. Default Check the box to make this identity your default. You can edit or delete an identity in the Actions column.